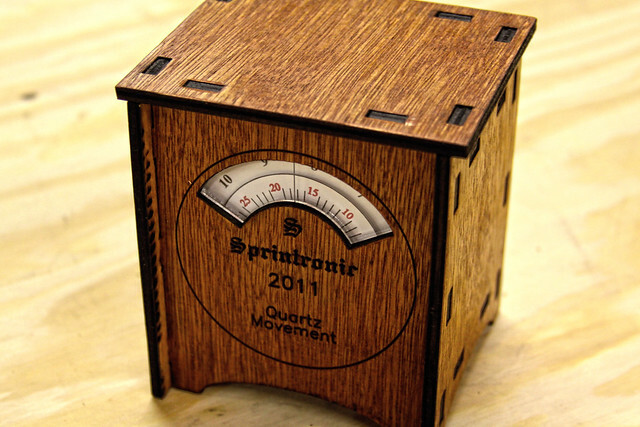 Recently Doug took on the goal of creating a clock that he could enter into an Instructables contest. For those who don’t know, Instructables is a great DIY website that is free to the public and houses tons of cool project ideas with step by step instructions (hence the great name!) including photographs for added detail to the process. The contest works by people voting up the best project; taking into account the quality of the instructions and the finished product itself. The Dallas Makerspace is really proud to have one of its own members entered into this contest and with such a fine work of craftsmanship. Doug took some time out for me to answer a few questions I had about the process. At the end of the interview you can find a link to his entry (there are two places to vote!) and I highly recommend that anyone who agrees with me about the beauty of this piece help Doug out and take a moment to vote. Q: What was your inspiration for the clock? the only one to tempt me. After some thought, I decided to make a clock based on this watch. Q: Can you give a brief list of the materials you used to make this? made with a scroll saw. Q: What do you most like about Instructables? teach lessons to businesses trying to retain information. Instructibles is also very practical for me. I do not have a blog. I don’t believe I could post enough fresh content to maintain interest. Q: Any tips you can impart for aspiring clock makers? A: The different ways to make a clock are endless. If you have an idea, flesh it out and make it. the Reasonability triangle. Is it easy? Is it inexpensive? Is it quick? Q: From your experience making this, how hard would it be for a beginner to construct? to a laser cutter, the case pattern can easily be made using a scroll saw and drill. Q: Where can people vote up this entry on Instructables? A big thank you to Doug for sharing his experiences and knowledge on this project. It certainly spurred a Clock Interest group within the DMS and now we can’t wait to start making out own!